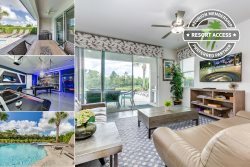 Luxury Vacation Properties Around the Corner from Walt Disney World® Orlando! Book one of these select properties and get a 20% off Introductory Offer. *Offer valid for new reservations arriving and departing between Now and December 17, 2017. Offer cannot be used in combination with any other promotional offer or discount. Not valid during the holiday season. Minimum of 7-night stay is required.